After watching the gorgeous sunrise in the Dhikala Grasslands deep inside Corbett National Park, we headed onto the safari road that borders the Grasslands. This road has the Sal forest lining it on one side with the Grasslands on the other side. With our sight fixed on the Grasslands, we slowly drove on this road when we heard a raptor’s call. We stopped to ID the species and when we spotted it, we got more than what we bargained for. It was a juvenile Crested Hawk Eagle feeding on a Pond Heron prey probably killed by its parent, that was calling from another tree nearby. 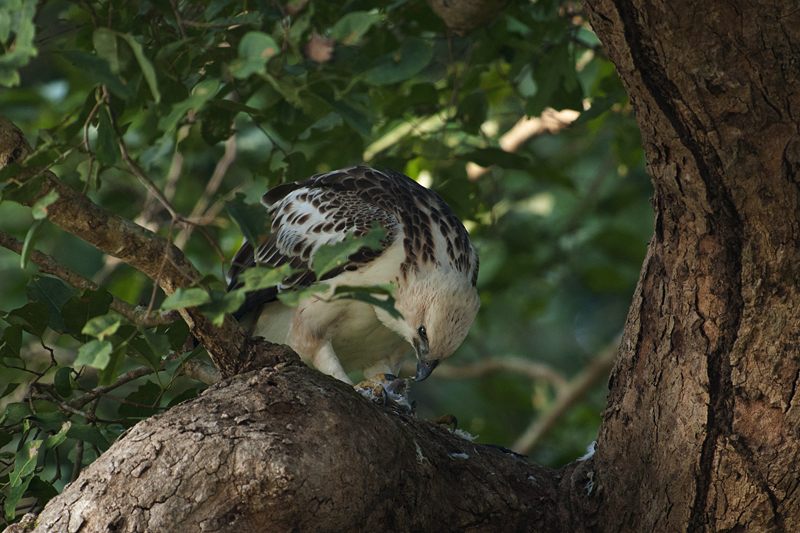 We watched this Crested Hawk Eagle shred and consume the prey leisurely. 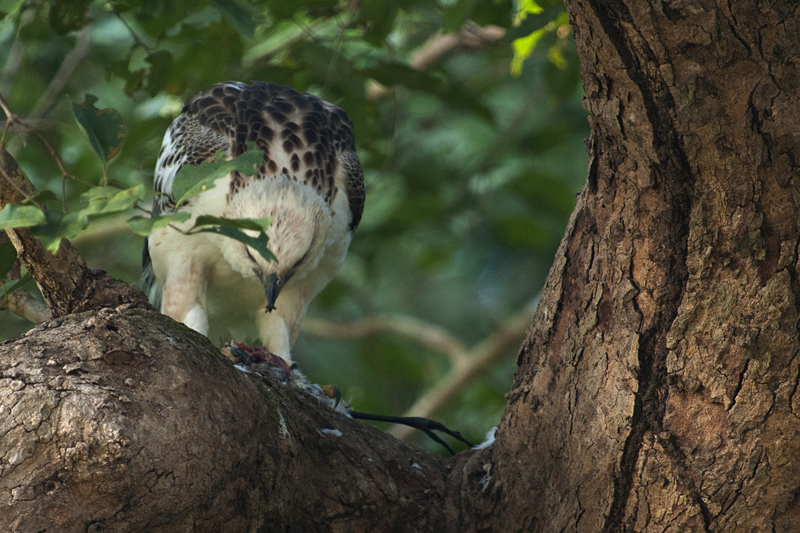 However, the feature image (above) is our best sighting of a Crested Hawk Eagle making a kill in Nagarhole National Park posted in Crested Hawk Eagle snatches a Parakeet. Being a foggy day, lighting was a huge challenge. My favorite D300, with 300mm f2.8 lens with 2x TC was struggling to get a sharp focus. Almost all the images were shot under 1/160sec. Given the 600mm focal length, getting a shake free image was literally impossible and we were lucky to come off with this set of images. We are posting these images to share this experience. 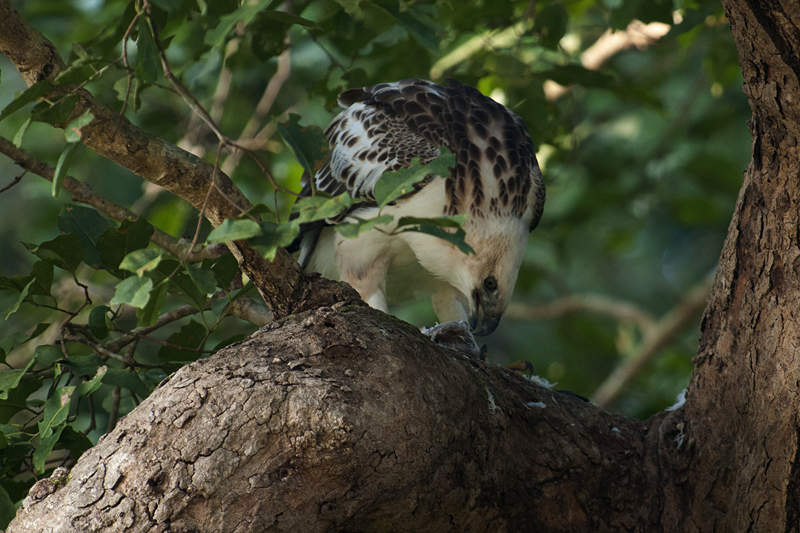 After watching the Crested Hawk Eagle finish eating its prey, we circled onto the Sambar road with renewed will to spot a Tiger. 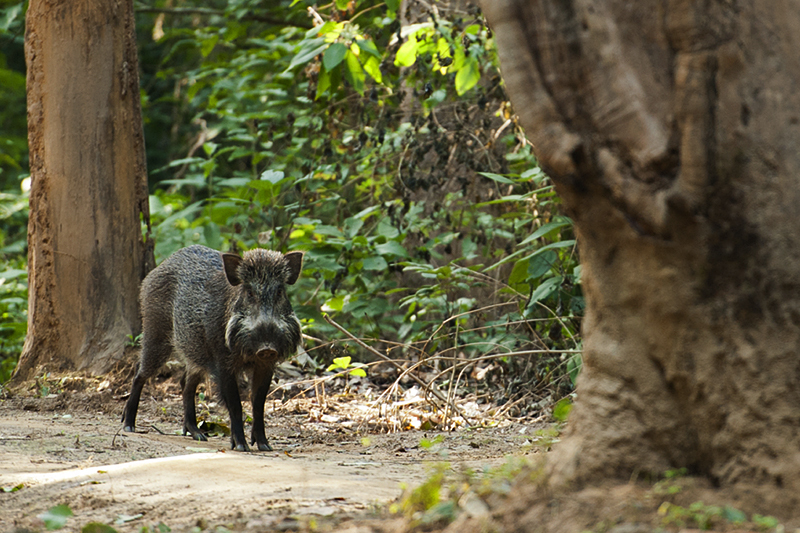 But all we managed was this fleeting glimpse of male Wild Boar (below) crossing the road before we returned to the Dhikala forest lodge for breakfast. Our last Tiger sighting in Corbett National Park is posted in the thrilling Tiger sighting in Corbett National Park.